Cylinder brushes are used for conveyor cleaning or wide face brushing of a product substrate on a production line. Spiral wound cylinder brushes are based on our strip brush technology, and are individually designed to meet the customer’s specifications. Paddle wheel style conveyor cleaning brushes also utilize our strip brush technology and offer a customer- refillable brush core. steel wire, stainless steel wire, brass wire, bronze wire, or other more specialized wire types, nylon 6-6 or 6-12, abrasive nylon, polypropylene, horsehair, tampico fiber, and other materials on request. 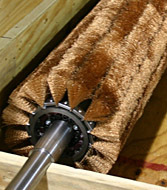 Spiral Brush has cylinder brush design experience in a broad range of applications including: agriculture, bakery oven brushes, lead acid battery production, block, and brick, and gypsum board production, concrete form cleaning, fiberglass insulation, filtration screen cleaning, foundry sand conveyors, glass cleaning, industrial pass-through ovens, metal fabricating, paper mills, oil & gas pipeline inspection, primary metals, printing, raised metal roofing, rubber and plastics, sawmills and plywood production. Our engineers and experienced customer service associates work with you to understand the application, the material to be brushed, the desired finish, the operating environment, and the equipment on which your cylinder brush will be installed. We will help you to determine the appropriate core, shaft, channel size and brush materials, establish power requirements, a recommended range of operating speed, and determine the need for dynamically balancing the cylinder brush. To learn more about cylinder brushes, or to request a quote, contact Spiral Brushes today.